It is interesting to notice how some minds seem almost to create themselves, springing up under every disadvantage, and working their solitary but irresistible way through a thousand obstacles. 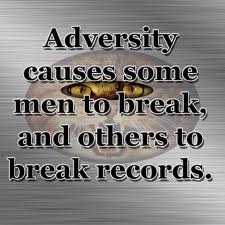 Sometimes, we face several challenging situation that gives us the opinion that the tunnel of adversity bears no end. This is the case of Kunle, a 10-year-old boy who decided to study judo despite the fact that he had lost his left arm in a devastating car accident. The boy began lessons with an old Japanese judo master. After three months of excellence, he discovered that the master had taught him, and repeated just a single move. Curious, he approached his master. ‘Sensei’ (Teacher in Japanese), he paused, thought once more and finally asked ‘Shouldn’t I be learning more moves?’. Smiling, the master answered patiently, ‘this is the only move you know, and the only move you will ever need to know’. Though not satisfied with the response, he kept an unwavering faith in himself and his master and continued vigorous training. Several months later, the Sensei registered Kunle for his first challenge during a tournament. Engulfed with surprises after easily winning the first two matches, he proceeded to the third match. The third match proved to be more difficult, but after some time, his opponent became impatient and charged. Deftly, Kunle used his one move and won the match. Amazed by the marvelous effect of his ‘only’ move, Kunle won several other matches and found himself in the finals. Now in the final match, Kunle’s opponent was bigger, stronger and more experienced. For a while, Kunle appeared to be overmatched. Concerned that Kunle might get hurt, the referee called a time-out. He was about to stop the match when the Sensei intervened, ‘No’, the Sensei insisted, ‘let him continue’. Soon after the match resumed, Kunle’s opponent made a critical mistake; he dropped his guard. Immediately, Kunle used ‘his move’ to pin him, thereby winning not only the match, but the tournament. Alas! He was the champion. On the way home, Kunle and his Sensei reviewed every move in each and every match. Summoning courage, Kunle asked a question that had been bothering him; ‘Sensei, how did I win the tournament with only one move?’. ‘You won for two reasons’, the Sensei answered. ‘First, you’ve almost mastered one of the most difficult throws in all of judo. Second, the only known defense for that move is for your opponent to grab your left arm, which you don’t have’. Unconsciously, Kunle was able to convert his biggest weakness and adversity to his greatest advantage and strength. Just like Kunle, consciously endeavour to review adverse situation and make effective use of the opportunities that comes along with it. Dr. Tai Solarin’s words’ stating that ‘may your days be rough’, if critically viewed confirms that adversities can be turned to one’s advantage. 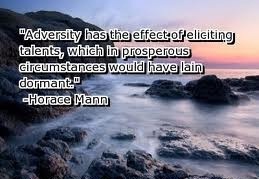 For you are special, important and talented, never magnify your adversity but amplify the advantages it can be converted to, and extract the best of it.